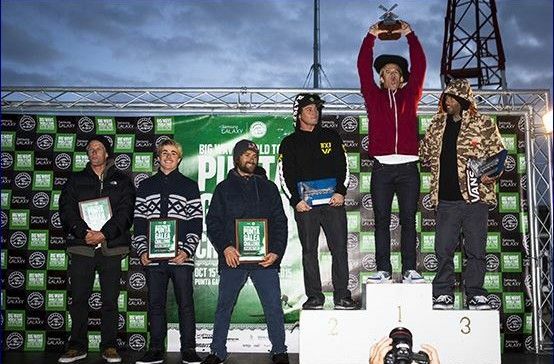 Punta Galea, Getxo / Basque Country (Thursday, December 11, 2014): Nic Lamb (USA) has won the Punta Galea Challenge in a moving 30-to-40-foot lineup ahead of Makuakai Rothman (HAW) and Nathan Fletcher (USA) to complete the podium. The exciting six-men final saw the lead change hands numerous times before Lamb could settle in first and take the event win. California’s big wave ambassador Lamb opened his wave account with an incredible 9.77 out of 10, for a long ride all the way from the outside on a 40-foot bomb. Taking control of the heat early on, Lamb managed to back-up his highest scoring ride with a bold move, dropping late on a lefthander heading straight into the rocks for a 7.00 point ride. Sitting in second after Rothman surfed two excellent waves, Lamb needed a strong statement to claim back the pole position. The Santa Cruz local selected another huge lefthander and survived a jaw-dropping late take-off to score the only perfect 10 point ride of the final and take the win. Despite an unusually slow first half of the final, Makuakai Rothman came back firing when he charged on a massive righthander to net an excellent 9.70. Building confidence instantly, Rothman went straight into another bomb to defend his highest scoring ride with a 9.20 and jump into the lead. Rothman waited patiently for another wave with high-scoring potential, but it was Lamb who found the gem in a moving lineup. Relegated to second place at Punta Galea, Rothman however solidifes his rankings lead heading into the final two events of the BWWT season. Nathan Fletcher waited for the final moments of the final to drop into a big left of his own, belting a 8.90 to jump on the podium in third place. Local favorite Natxo Gonzalez (EUK) started his final campaign at the halfway mark, but on his backhand unfortunately couldn’t produce enough speed to escape a white-water avalanche coming at him. The risk-taking and difficulty of the ride was rewarded with an 8.00 and put Gonzalez right back in the mix for the event title. Gonzalez was left scouring the lineup searching for a back-up score but only found an excellent righthander right after the buzzer sounded the end of the final. With a fifth place in Punta Galea today, Gonzalez confirmed he’s the strongest big-wave surfer hailing from the Basque Country. Gabriel Villaran (PER) and Patrick Gudauskas (USA) complete the final, placing 4th and 6th respectively. 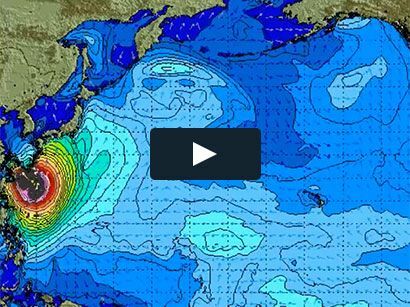 The Punta Galea Challenge is webcast LIVE via www.aspworldtour.com.